Some people just can’t take a hint. WE DON’T WANT TO TRAVEL TO YOUR REALM OF FIRE, JERRY, THANK YOU. YES. YES, THANK YOU FOR IRONING MY SHIRTS BUT I THINK IT’S TIME YOU WENT HOME. The song that played while I drew this. 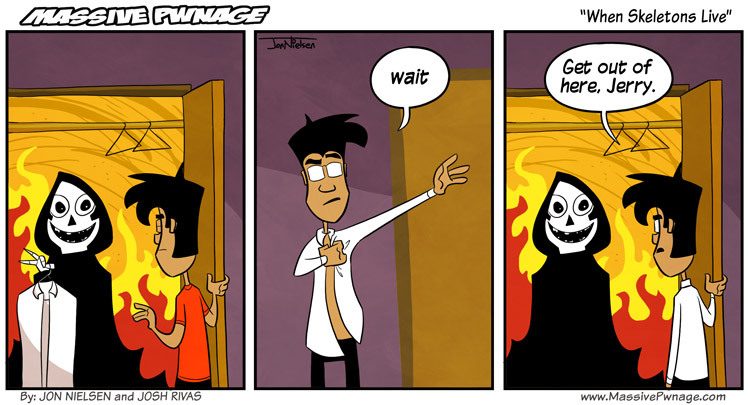 This entry was posted on Friday, July 1st, 2011 at 12:00 am and is filed under Comics. You can follow any responses to this entry through the RSS 2.0 feed. Both comments and pings are currently closed. Wait, i think i had seen this Jerry guy somewhere!